Summer is the time of year for outdoor grilling. 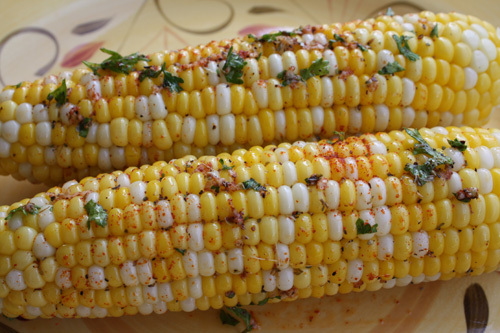 One of my favorite things to grill is corn on the cob. Angeline DeMitri in Doubting Thomas – Book 1 of my Tarnished Saints Series agrees with me. She has a recipe for picnic corn on the grill that is delicious. Angel, can you tell us about it? Angel: Sure, Elizabeth. This is a really easy recipe that anyone can make, even if you don’t like to cook but love to eat. When my daughter, Gabby and I met Thomas and his six boys I knew there were a lot of mouths to feed. We love going to the beach and having meals outside so the kids can play in the water at Thunder Lake. And since we’re married now, we tend to grill a lot in the summer because the kids all love it. Here is one recipe that always goes over well. Start out by soaking the corn right in the husks in cold water for 20 minutes to an hour before cooking. Then trim off the end with the silk, but leave the other end on as well as the husk. Throw it right onto a medium hot grill, and turn every ten minutes or so. It’ll take maybe close to a half hour to grill, more or less depending on how you like it done. In the meantime, get together a sauce you are going to spread onto the corn once it’s done. You can make as much as you want depending on how many corns you have. This recipe will be good for about four corns. Mix it all together. Now, when the corn is done, peel back the husks. You can leave them connected for the kids to be able to pick up the cob to eat it if you want. Then stir the mixture and brush it on. If you like it spicy, use the cayenne, if not, use the paprika for color. This gives the corn a great flavor and you don’t need to use butter.